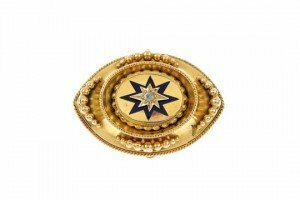 A late 19th century gold enamel and diamond memorial brooch, of marquise-shape outline, the rose-cut diamond and blue enamel star, to the rope twist and bead surround. 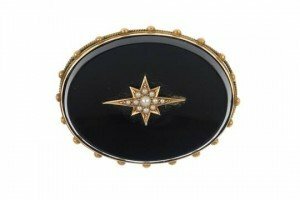 A late Victorian gold, onyx and split pearl memorial brooch, the oval onyx panel with central split pearl star, outer split pearl and beaded surround and vacant reverse back panel. 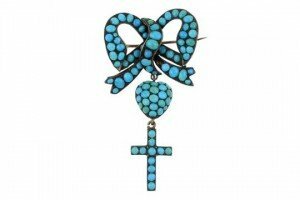 A late 19th century turquoise memorial brooch, designed as a bow suspending a heart with a vacant hair panel to the reverse and a cross, all set with turquoise cabochons. 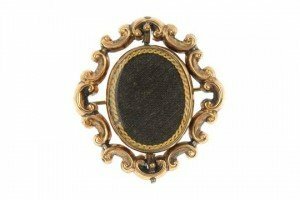 A late Victorian gold swivel brooch, circa 1890, the oval-shape double-sided panel, rotating within a scrolling surround. 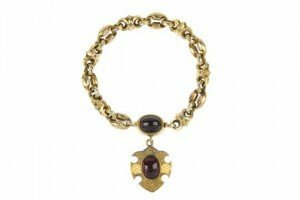 A late 19th century gold garnet bracelet, the fancy-link faceted chain to the oval garnet cabochon set clasp with vacant hair panel reverse, suspending a shield-shape pendant with central garnet cabochon to the foliate and floral engraved surround. 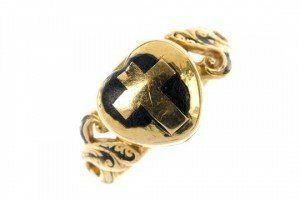 An 18ct gold mid Victorian enamel memorial poison ring, of heart-shape outline, the hinged compartment with black enamel cross front, to the black enamel scrolling sides. 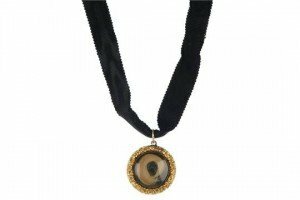 A late Victorian gold memorial pendant, the circular-shape glazed panel and reverse, within a floral embossed surround, suspended from a black ribbon. 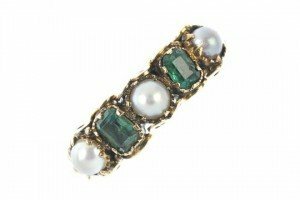 A late Victorian gold emerald and split pearl ring, designed as a replacement rectangular-shape emerald and split pearl line, to the scrolling gallery and foliate shoulders. 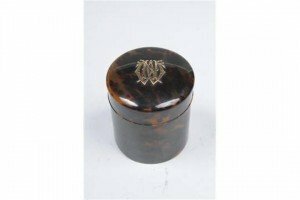 A late 19th early 20th century tortoiseshell and gilt metal mounted initialled box of cylindrical form with a screw top. 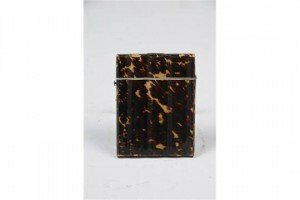 A Victorian Tortoiseshell hinged card case,of shaped rectangular form,red velvet lined interior ,with button opening. 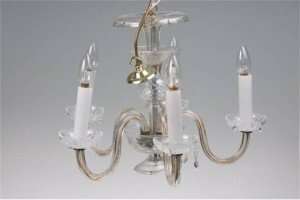 A glass five branch chandelier, 20th century with a trumpet shape shaft cut with lozenges each scrolling branch with petal shape candle holders complete with clear glass light bulbs. 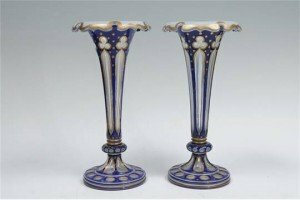 A fine pair of Bohemian overlay glass vases, late 19th century each of elongated trumpet shape form with a folded gilt rim, the body cut with panels with flowers against a blue ground on a knopped stem and round spreading foot. 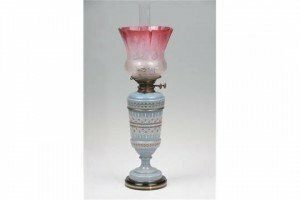 A Victorian opaque glass paraffin lamp with a ruby and clear glass acid etched tulip shape shade, clear glass funnel, opaque glass and enamel decorated reservoir supported on a vase raised upon a treacle glazed circular base. 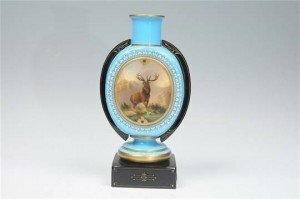 A Victorian blue opaque glass vase painted with a raised oval of a stag at bay after Landseer against a pale blue ground applied with white enamel and gilt leaves, circular base raised upon a black glass and gilt highlighted plinth. 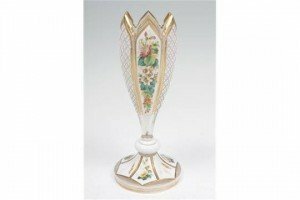 A late 19th century continental overlaid glass vase of tapering form with panels decorated with blooms and leaves interspersed with facets with enamel decoration raised upon a trumpet shape base painted with blooms. 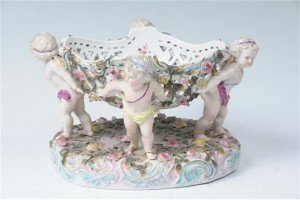 A 19th century continental Plaue comport, supported by four winged cherubs applied with roses and leaves raised upon a circular flower encrusted base under glazed blue mark. 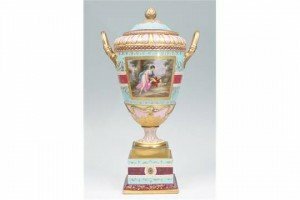 A 19th century Vienna two handled vase and cover restored with a bell shaped top, leaf and fruit finial above a panel painted with a classical maiden and a winged cherub, the reverse painted with a classical maiden beside her companion against a blue and crimson ground raised upon a stepped plinth base. 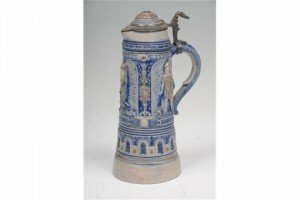 A German stoneware and pewter lidded jug decorated with panels of warriors against an incised ground, each with plaques Sanheib. 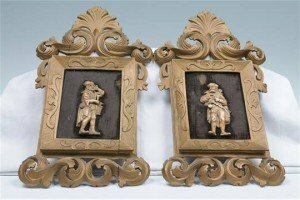 A pair of Continental wall plaques each applied with carved figures, one modelled as a sportsman holding a basket with a game bird and a companion, each within leafy frames. 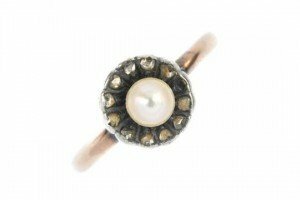 A late 19th century gold and silver diamond and cultured pearl ring, the cultured pearl, within a rose-cut diamond surround, to the plain band.